Lincoln, Neb. (September 4, 1967) – Jerry Blundy set the record but Gordon Woolley was the one who found the groove as sprint car racing came to a close Monday at the fairgrounds track. 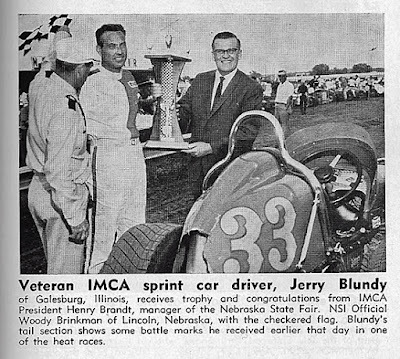 Blundy, the cagey veteran from Galesburg, Ill., held the lead all 30 laps in cutting almost three minutes off the track record while winning and Nebraska Sweepstakes feature. Blundy’s victory was so convincing that fans might have been lulled to sleep if it wasn't for Woolley. The wily Waco, Tex., speedster exploded from 14th place at the start of the race to finish in fourth place just ahead of Lincolnite Joe Saldana. The balding veteran couldn't catch up to Blundy, however. Woolley’s dash was accomplished in a car here been driving for only three weeks – the Charlie Goodrich special. Track records were fair game on Monday with the Fairgrounds half-mile oval blazing fast. The rain that washed out Sunday schedule races soaked the track just about perfectly. The 8-lap record was snapped in the first heat race by Jerry Richert but Norm Fall of Auburn, Calif., cracked it again moments later in the second heat. The expected duel between Richert and current IMCA point leader Karl Busson failed to develop – and a lack of time in the sack probably had a lot to do with it. Richert, whose motor conked out after 21 laps in the feature, probably was lucky he didn't conk out himself. The Forest Lake, Minn., driver raced Friday and St. Paul came to Lincoln for Saturday's race, returned to St. Paul for a 200 lapper on Sunday and return to Lincoln again for Monday's race. Busson who finished eighth in the feature was in the same boat as Richert. The two rode together during this weekend’s grueling shuttle between Lincoln and St. Paul. First Heat: Jerry Richert, Forest Lake, Minn.
Second Heat: Norm Fall, Auburn Calif.
Third Heat: Bob Tomlinson, Palos Park, Ill.
Don Mack, Grand Forks, N.D.
Roger Lane, Blue Springs, Mo.